Ex-Midland Railway 0-6-4T 'Flatiron' No 2029 and ex-MR 2F 0-6-0 No 3492 are seen standing on the down goods line alongside Saltley station in 30th Aug 1930. 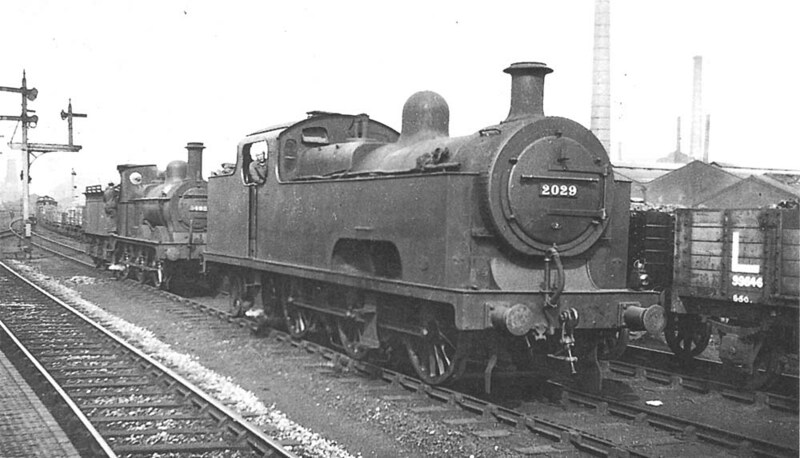 Built by Derby works in July 1907, No 2029 was a member of a class never considered successful although it remained in service until it was withdrawn from Saltley shed in January 1937. However No 3492 was a member of the MR's successful 1873 class built by Neilson & Co circa 1896. The class was long lasting and No 3492 remained in service for nearly 65 years being renumbered by British Rail as No 58271 to be withdrawn from nearby Monument Lane in June 1961 and scrapped shortly afterwards.